Today’s inspiration board was all about showing you how a few different shades of just one colour can create a clean and chic colour palette for your wedding – and that brown is anything but boring! I really think over the years it has had something of a bad rap, but in fact it can be elegant and wonderfully warming for Winter, especially when mixed with gold and bronze….. The glamorous bride captured by Laura Gordon Photography, which formed the basis for this board, perfectly illustrates the opulence and beauty of this simple yet chic palette. Warm shades of coffee, toffee and caramel mixed with gold and bronze look as delicious and decadent as they sound and are perfect for a Winter (or Autumn) wedding. The key to this palette looking pretty rather than dowdy on the day, is to infuse your wedding with rich metallics as well as lots of texture in your details and decor. 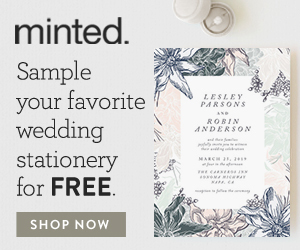 Think chandaliers, letterpress stationery, leaves and lace! So create place settings with gold chargers atop lace table runners and ornate vintage cutlery tied with velvet ribbon; incorporate candelabras, cut glass serveware and wreaths of dried leaves. And how about draping soft wool blankets over the backs of your guests seats to keep them snug after the sun sets. Of course if we’re talking brown, texture and vintage charm, then it must be tweed for the boys – they will look super dapper! Or for something a little more formal a tuxedo would also look fabulous. And this is such a beautiful colour palette for bridesmaids too! Shy away from the shades of brown, and instead opt for mismatched golds and neutrals for a really decadent and elegant look that your girls will love. If you love this, then how about some other wedding colour palettes and inspiration boards perfect for Winter? Take a look at this rich and romantic Plum & Gold board, or this chic colour palette inspired by Paris would look just as lovely in Winter as it would in Autumn!, or how about this snow dusted Winter Wonderland? For more holiday season inspired Winter colours take a peek at this palette, and last but not least, how about these 5 perfect palettes for a Winter wedding? Lots of lovely colours and ideas for you Winter brides-to-be!